Stories from the winemaker, new recipes, happenings around the winery, and more. What do winemakers do with themselves outside of harvest? I can’t tell you how many times I’ve been asked this question. The truth is that we keep busy with the different cycles of vineyard and cellar work. As soon as the last 2017 barrel is put down in the cellar after harvest, we start breaking out the 2016 wines to work on our blends. Both the Atelier Melka and Andis teams are very excited about the 2016 Zinfandels and Barberas that we will be bottling in April. When I’m not crawling through stacks of barrels or working on blends, I’m walking through our Estate vineyard. A lot of exciting changes are happening this year. If you’ve visited the winery recently you would have noticed that the vines closest to the parking lot were removed. These were some of the original Zinfandel vines planted on their own roots in 1978. Unfortunately, nature had taken its course with these vines and they were starting to succumb to the pest Phylloxera. After years of declining yield, we decided to remove the vines to pave the way for something new. The team and I are very excited to be planting Cinsault (pronounced Sin-So). This varietal is prominently featured in red and rosè wines from Southern France’s Languedoc-Roussillon region. For the few who were able to try our small lot bottling, you may be excited to hear that we will be expanding the Schioppettino (pronounced scope-a-tino) vines in our vineyard. In the coming weeks we will be grafting our Malbec block over to Schioppettino and Cabernet Sauvignon. 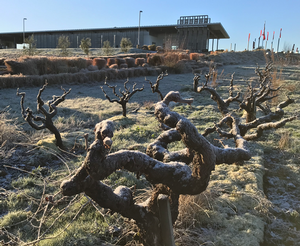 The second most common question I’m asked in the tasting room this time of year is about the cold weather’s effect on the vines. In the last two weeks we’ve had freezing temperatures and even snow in Plymouth! However, this time of year the vines are dormant and totally unaffected by the cold, unlike the bundled up winemakers and vineyard managers. Luckily we finished pruning before the coldest weather hit. In a few weeks we will start to see budbreak throughout the valley. Budbreak is when the vines wake up from their dormancy and begin to push little green shoots from their buds. This event will mark the beginning of the 2018 growing season. To add to our excitement, 2018 will be the first year we are harvesting Sauvignon Blanc, Syrah, and Petite Sirah from our Estate vineyard. Stay tuned, more news to come! If you asked us two weeks ago, we would have told you we’d be taking the long weekend off. I would have been relaxing by a lake with a refreshing bottle of chilled Andis Semillon. But sometimes Mother Nature has other plans for us. This latest heat wave sent many wineries into a picking frenzy. The field numbers that looked nice and stable not two days prior were starting to jump all over the place. The slow and easy trajectory of the vintage turned into a pipe dream. The staff and I ended up processing all of the 2017 Andis white and rosé grapes in just a four-day window. But surely coming out of a drought, after getting all that rain this winter, the vines must have kept their cool. Right? There is a saying that “stressed vines make great wines”. However, heat and water stress have very different effects on the grapes. Some varieties and vineyards handle the heat better than others. Older, dry farmed vines like those at Andis have extensive root systems that allow them to keep cool and ripen on their own schedule. They have spent years chasing water deep in the soil, as opposed to younger, irrigated vines that rely too much on the farmer for water. Regardless of age, heat pulls water from the grapes. This loss of water concentrates the sugars, flavor and acids. For that reason my two interns and I ran around the Shenandoah Valley every few days sampling each vineyard we source from to make sure we get our picks right. While that sounds like a lot of work, our diligence paid off. The whites and rosé came in with beautiful acid profiles, stellar sugar levels and amazing flavor. Now that the worst of the heat is behind us we can take a moment to relax, but just a moment. The bulk of our reds are just around the corner from being picked. 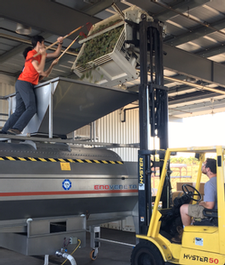 The first trickling of our Estate Zinfandel grapes, as well as Petit Sirah from around the area, have made their way into the winery. These two varieties don’t usually come in before some of our lighter grapes such as Grenache. But we always adapt to the situation and tell ourselves “when they’re ready, they’re ready.” The heat wave this year threw many of us for a loop. It forces us to think about things differently than we’re used to, to make the most out of what nature has given us. Not to say that this is a bad year (to the contrary, I think it will be excellent! ), but it has so far been a year that has kept us on our toes. Making us work a little harder to process everything in a shorter window than we planned. But the long hot days and late nights will all be worth it when I have the chance to share my Andis debut with the tasters who stop by! Do Old Vines Make Better Wine?